The first time I moved, I was 12 years old. When we arrived in Omaha, Nebraska from Los Angeles, somehow I got the idea in my head that when you move somewhere new, the neighbors will bring you chocolate chip cookies. It was the only thing I had to cling to as we left everything I knew behind to start over in the Midwest. If I remember correctly, no one brought us cookies. But I still carry with me today that idea of welcoming neighbors and hospitality, and remember how eager I was to feel accepted in my new surroundings. For the record, everything worked out fine in Omaha and the neighbors were friendly despite the noticeable lack of cookies! Our friends Geoff and Annmarie just moved into our neighborhood (you remember Annmarie, right? ), so of course I was so excited to make them a welcome treat! They didn't have too far to come, they lived a mile away before and now it's a couple of blocks. But still, it feels a lot closer, and they're now officially in our neighborhood! 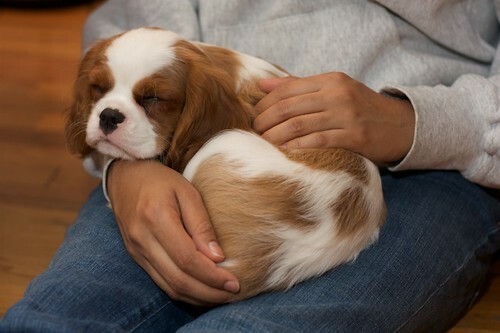 (Oh, and they just got a Cavalier King Charles Spaniel puppy last night. Eeeeep!). Given the dozen pounds of berries that came into my possession recently, I knew I wanted to make something fruity. 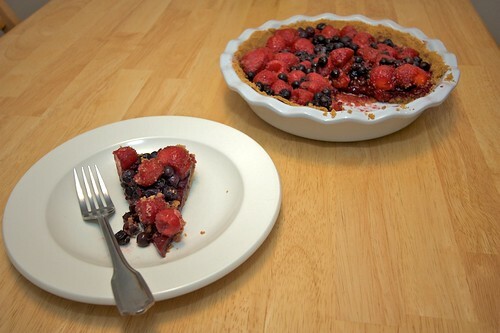 After flipping through my new America's Test Kitchen Family Baking Book, I decided on Summer Berry Icebox Pie. The recipe allows for any combination of berries, as long as it adds up to 6 cups, so I used half strawberries and half blueberries (that Annmarie had given me as she was getting rid of stuff for the move). I'm not sure it was the ideal combination, but in the end I hear it was amazing. Also, I didn't have any apple or red currant jelly, and it was midnight by the time I got to that part, so I used some local marionberry jam for an extra berry kick. Welcome to the neighborhood, guys (channeling my inner Mr. Rodgers)! 1. Adjust an oven rack to the middle position and heat oven to 325 degrees. Process the graham cracker pieces in a food processor to fine, even crumbs, about 30 seconds. Sprinkle the butter and sugar over the crumbs and pulse to incorporate. 2. Sprinkle the mixture into a 9-inch pie plate. Use the bottom of a measuring cup to press the crumbs into an even layer on the bottom and sides of the pie plate. Bake until the crust is fragrant and beginning to brown, 13 to 18 minutes. Following the particular pie recipe, use the crust while it is still warm or let it cool completely. 1. Gently toss the berries together in a large bowl. Puree 2 1/2 cups of the berries in a food processor until very smooth, about 1 minute (do not under-process). Strain the puree through a fine-mesh strainer into a small saucepan, pressing on the solids to extract as much puree as possible (you should have about 1 1/2 cups). Discard the solids. 2. In a small bowl, whisk the sugar, cornstarch, and salt together, then whisk them into the strained puree. Bring the puree to a boil over medium heat, stirring constantly, and cook until it is as thick as pudding, about 7 minutes. Off the heat, stir in the lemon juice and set aside to cool slightly. 3. 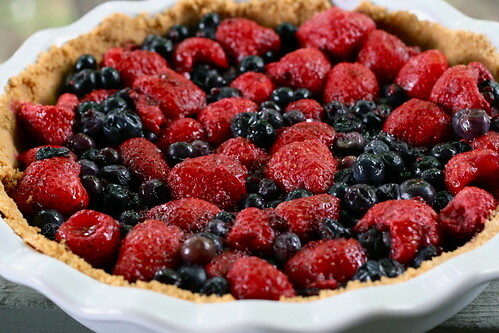 Pour the warm berry puree into the baked and cooled pie crust. Melt the jelly in a small saucepan over low heat, then pour over the remaining 3 1/2 cups berries and toss to coat. 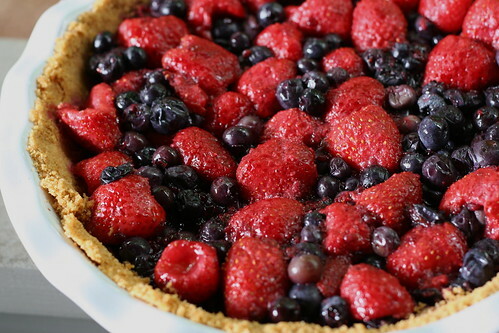 Spread the berries evenly over the puree and lightly press them into the puree. Cover the pie loosely with plastic wrap and refrigerate until the filling is chilled and set, about 3 hours. Serve chilled or at room temperature. um, YUM. gorgeous pictures!!! I made sherbet with the same berry combo today (well, except for the marionberries). Yay summer! I am a huge fan of delivering goodies to new neighbors! Good job for continuing the tradition!! I can't wait to meet her new puppy! i would want to move into your neighborhood just for one of these pies!! This recipe looks amazing! Hello :-) Fellow amateur food blogger here - I love food blogs that tell a story. I, too, romanticize the idea of having neighbors bring fresh baked goods. Of course, now I've been living in my condo for over 2 years, and don't know a single person in the building. If I was aware of anyone moving onto my floor, I'd gladly bring something over! Love your blog...this is my first time stopping by : ) Your pie looks so scrumptious, what lucky neighbors. My daughter would go crazy over that cute puppy...what a cutie!! WOW. That pie is absolutely stunning. So delicious. I can't wait until I get some fresh berries so I can try it! I had to finally give in and figure out how to post comments on your blog! This pie was so amazing - as is everything else you make! You are the best neighbor ever and so sweet!! :) Thanks so much, love you! I am salivating over this pie! It looks AMAZING! I love your photos. What kind of camera do you use? Thanks everyone! I finally got to taste the pie yesterday. I really don't like graham cracker crust but I found myself eating every last crumb...the whole thing was that good! Well, the puppy looks satisfied! In keeping with your theme, I'll say that this recipe will be perfect as our garden is bursting with raspberries and our neighbors are trying to get rid of blueberries by the bucketful. Here's a pie that will capitalize on both. Don't worry...we'll share with the neighbors when we're done.